I've really had a hard time trying to get in the mood to post lately. Things have been a little stressful around the house. Not really being on a schedule has made it crazy. And, the "honeymoon" phase with FES being over hasn't helped. I'm a complete bear if I don't get my full night's sleep. I had about 3 full nights' sleep during the break. ME + waking up at night and not being able to go back to sleep = 1 grouchy woman. Add to that crazy hormones, and, well, I guess you get the picture. A total and complete witch. And you know what? I'm completely okay with it. Unfortunately, at least around here, that's what it takes for things to get done. I am sorry for the sleep deprivation. I understand fully...last night...my body slept well....but my mind never shut down. I've heard more people complain about lack of sleep over the holidays than ever before. I hope you get some sleep and back into a routine soon! 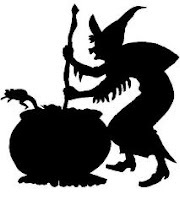 You are welcome to hang out at my caldron in the basement any time you want! Loved the last comment. :-) Sorry it's been difficult of late, Mary. I'll be sure to offer up some prayers for you, dear friend. We've all had our witchy days, weeks....God forbid....months! But by His grace, we make it through, forgive ourselves and go on. "IF YOU WANT BREAKFAST IN BED, SLEEP IN THE KITCHEN." "NEXT MOOD SWING: 6 MINUTES. YOU HAVE BEEN WARNED." YOU HAVE THE RIGHT TO REMAIN SILENT, SO PLEASE....SHUT UP." "DON'T UPSET ME! I'M RUNNING OUT OF PLACES TO HIDE THE BODIES." LOL! My hormones have been off kilter since I was starting puberty! I joke with a sister and told her once, I should put a sign in the yard, "The b**tch is back!" My progesterone cream has made a HUGE difference! The hormones can do a number on us. Sorry about the missed sleep. I find that I don't care about things the way I use to. I hope you get your needed sleep, that makes me a bear too. Unfortunately for my family, I completely understand what you are going through....me too! I hope it gets better for you soon, girl!